Full-size flavored bagels and flavored 1 percent milk may be making a comeback in Maine school cafeterias next year, now that the Trump administration is relaxing nutritional standards for the National School Lunch Program. The change, announced by the U.S. Department of Agriculture this month, ends the Obama-era requirement that schools serve only whole grain and skim milk, and eases salt restrictions. Under the new rules, only half the food needs to be whole grain, flavored and low-fat milk is allowed, and schools can take more time getting to lower sodium limits. But not everyone is planning big changes – they like the healthier food and don’t see any need to change the menu. “I have a whole grain dinner roll that I offer on a daily basis, and I can’t keep them on the shelf,” said Dorothy Janotta, food service director in Regional School Unit 6 in Buxton. Janotta isn’t the only one wincing at the changes that are supposed to make her life easier. Portland Food Service Director Jane McLucas said she doesn’t want to make changes because of the relaxed standards, which take effect next summer, but she may have to if manufacturers start dropping some of the whole wheat products if sales start to slow. “They’ll probably stick with things like the whole grain hamburger rolls, but some of the lesser-used products, they may decide to let go of if as demand falls,” McLucas said. U.S. Agriculture Secretary Sonny Perdue said the changes are intended to give schools more flexibility in what they serve, and to reduce waste. “If kids are not eating what is being served, they are not benefiting, and food is being wasted,” Perdue said in a Dec. 6 statement announcing the new standards. 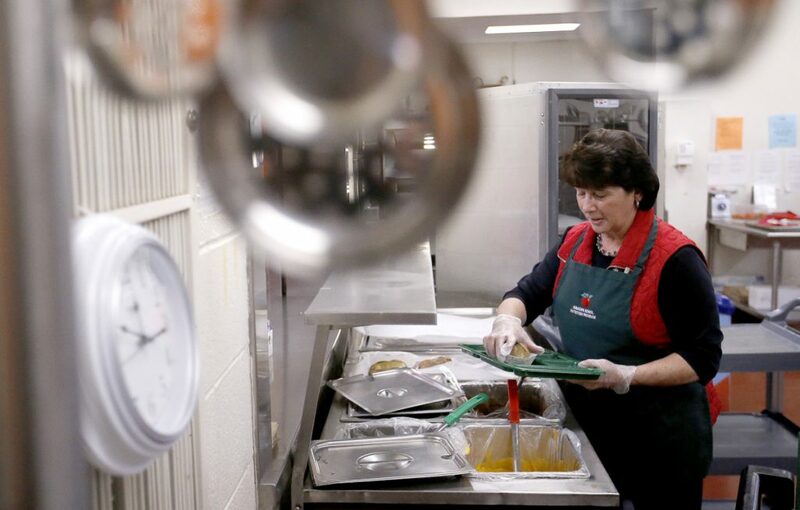 Dorothy Janotta, school nutrition director, serves baked potatoes at Bonny Eagle High School. “We try to stay up on the trends but stay within the standards,” she says. There are 99,000 schools involved and 30 million children fed annually through the federal school meal programs. When new nutrition standards were announced in 2012 and embraced by then-first lady Michelle Obama, there was a difficult transition, officials say. The federal Government Accountability Office did two reviews in the years after the transition, and found participation declined by 1.4 million children (or 4.5 percent) from 2010-2011 through 2013-2014, to 30.4 million children. The GAO found there were reports of food waste – students taking the servings of fruit and vegetables they are required to take but throwing them away – but the second report found that waste was tapering off. Districts also reported difficulty finding food that met the new requirements and that some districts saw a decrease in revenue because students didn’t purchase food that met the new requirements. In Maine, three districts have dropped out of the federal school lunch program because they found the requirements too limiting and, in at least one case, caused a budget shortfall because students stopped buying school lunch. At the time, there were few whole wheat products on the market, and some products simply weren’t appetizing, or looked too different for students used to refined flour products, Janotta said. Portions were smaller for some products, to avoid triggering calorie, sodium or carbohydrate limits. But manufacturers improved products and adjusted their offerings to meet the new standards – and students got used to the new menus. “I like it. I think more would be good,” said Kody Libby, a sophomore at Bonny Eagle High School, as he ate a slice of pizza. He gets school lunch every day, and didn’t even realize it used only whole wheat products – including the crust on the pizza he was eating. It’s just what he’s used to now. Cafeterias today look more like mall food courts than the old-fashioned image of a single line of students getting a spoonful of something on a plastic tray. 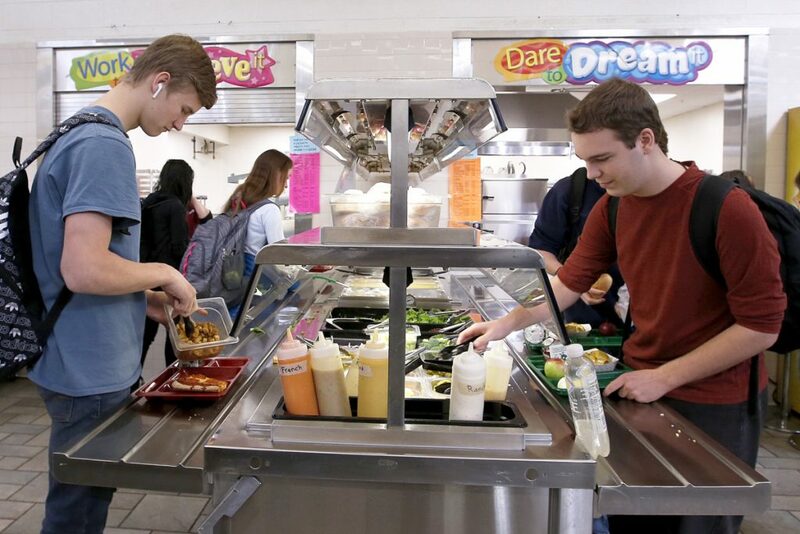 There is a large salad bar at Bonny Eagle, a baked-potato bar where students pick toppings such as broccoli and cheese sauce, and a hot entree – pizza on this particular day. 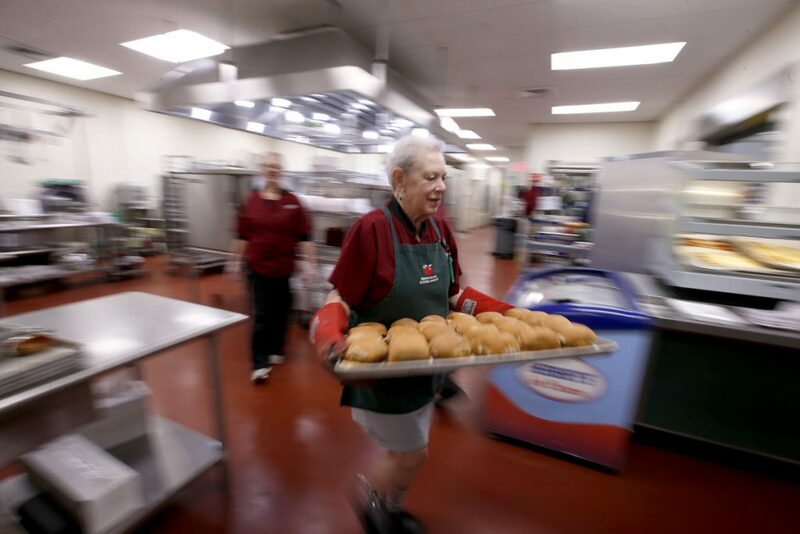 Marlene Pottle, a cafeteria worker at Bonny Eagle High School, carries a tray of chicken fillet sandwiches with whole-grain buns to a warming oven. The Trump administration may have rescinded some Obama-era nutrition requirements for public schools, but some districts are keeping it old-school. Tanner Meserve, 17, speared a striped beet off his salad and showed it to his friends before popping it in his mouth. Bonny Eagle’s cafeteria food is good, he said. “I love the minestrone soup,” Meserve said. McLucas said schools in other parts of the country may be under more pressure to offer up regional dishes, such as grits in the South or tortillas in the Southwest, that are traditionally made with refined grains. The tougher nutritional standards were enough for three Maine schools to drop out of the federal lunch program, forgoing a federal subsidy – 31 cents per meal – for students qualifying for free and reduced lunch. The schools, all in wealthier districts, have few students who qualify for free and reduced lunch. Those schools now shoulder the cost of those few students’ meals, but overall officials expect revenue will increase because they will sell more cafeteria food to all students. Falmouth High School and Greely High School in Cumberland left the program years ago, and Cape Elizabeth just dropped out last month. He points to bagels as an example of the problem: They are popular and students want them, but the only one allowed under the guidelines, he said, was a “small, two-ounce whole grain bagel.” Or macaroni and cheese – even with whole grains, the portion could only be two-thirds of a cup, not enough for a hungry high-schooler. Esposito said so many students stopped buying cafeteria food that the school lost about $80,000 in revenue. Now that they’ve dropped out of the program, he can bring back high-demand items that are nutritious and a lot healthier than going off-campus for fast food.